We've received a lot of inquiries about this. However, the club is keeping everything hush-hush until an unveiling, probably in January. Hint: the uniforms will have a more traditional look. This is getting ridiculous. The organization and media act as though the new uniforms are a big secret, but RC has known the details for months through very little prying. And even more interesting, the Royals seem to undermine their own efforts to keep this secret by actually publishing photos and videos of the players in their new digs! For instance, if you want to know what the new home uniforms will look like, all you have to do is go to kcroyals.com and click on John Buck's "message of thanks to Royals fans" to see a video of Buck wearing the new home uniform. John Buck models the new road uniform at a Union Station event. RC correspondent Chris Ray brought this to our attention, and sure enough, Buck's jersey in the photo is a perfect match to what we'd heard the new road uniforms would look like. So there you have it, Royals fans. The only new jersey yet to be publicly unveiled by the Royals is the black alternate, but we already know it will have "Kansas City" in script across the chest, rather than "Royals." Funny that some people are still referring to the new uniforms as a "secret." 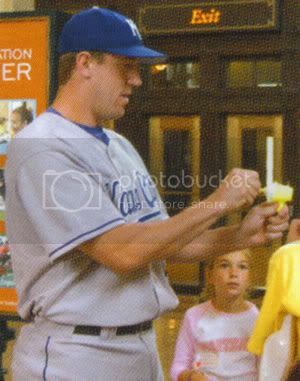 You can't blame the Royals brass for fearing the national media firestorm that will be unleashed when the new uniforms are revealed (this photo of Buck is on par with a CIA leak).